Otis Futon Grip. . .
A vitalized spring-like, medium soft feel will envelop your body when you experience the plush comfort of our multi-high-density soft and firm foams pressurized together in this high profile mattress. This Otis futon mattress is engineered to keep its shape and resist change in firmness -- be it on the edges or in other critical sitting and sleeping areas -- better than any cotton based futon mattress. More resilient top quality cushioning materials allow for continued daily use without worry of fading comfort or sagging mattresses. Copious amounts of highly resilient foam and fiber create an "inside out" force against the mattress ticking that is necessary for proper and comfortable support, whether sitting or sleeping. 14 inches of stuffing is compressed to fit inside an 8 inch border. Multi-high-density soft & firm foams pressurized together provide a spring-like medium soft feel. Designed for 10-12+ years of everyday use. 14" of overstuffed goods are compressed to provide a true thickness of 8". Weighs only 50 lbs per full size futon. Multiple uses in the home. Can be used on a bi-fold frame. 8" box recommended for overcover. A 10" blend of high performance foam which has a 2.0 pound and 2.5 pound density that provides the ability to keep the mattress looking and feeling good. An FR rayon wrap protects the mattress and gives a clean finished look. * Size is measured before vacuum packaging, please allow 7-10 days after unpacking for expansion. 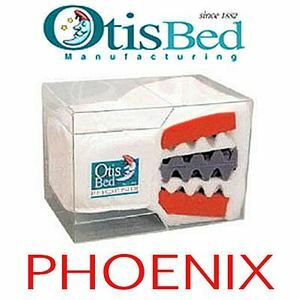 Our Otis futon mattresses are made to order and drop-shipped directly from the manufacturer usually within one week.